Paris, Oct 26 (IANS) Indian shuttlers Saina Nehwal, P.V. 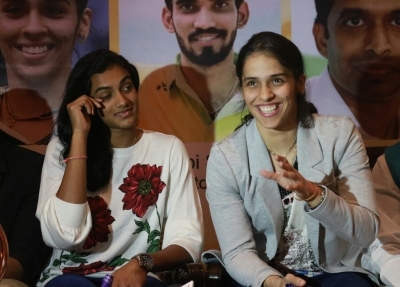 Sindhu, Kidambi Srikanth, H.S. Prannoy and the women’s doubles pair of Ashwini Ponnappa and N. Sikki Reddy entered the second round, while Parupalli Kashyap exited in the opening round of the French Open World Superseries here on Wednesday. Saina Nehwal defeated Line Hojmark Kjaersfeldt of Denmark 21-14, 11-21, 21-10 in 50 minutes. She will face a tough challenge against Japanese fifth seed Akane Yamaguchi in the second round on Thursday. Second seed Sindhu was given a tough fight by Beatriz Corrales of Spain before the Rio Olympic silver medallist prevailed 21-19, 21-18 in 35 minutes. Sindhu will meet Japanese Sayaka Takahashi for a place in the quarter-finals. In the men’s singles, B. Sai Praneeth also joined Srikanth and Prannoy in the second round. Srikanth advanced to the second round after German Fabian Roth retired trailing 0-3 in the first game due to physical problems. Srikanth will face Hong Kong’s Wong Wing Ki Vincent in his next match. Prannoy got past South Korean Lee Hyun II 21-15, 21-17 in 43 minutes to set-up an encounter against Denmark’s Hans-Kristian Solberg Vittinghus. Praneeth overcame Thailand’s Khosit Phetpradab 21-13, 21-23, 21-19 in an hour and five minutes. The Indian will meet Japanese qualifier Kenta Nishimoto on Thursday. However, for Kashyap, it was a disappointing day after he lost to Indonesian Anthony Sinisuka Ginting 23-21, 18-21, 17-21 in an hour and 14 minutes. The men’s doubles pair of Manu Attri and B. Sumeeth Reddy fell 11-21, 13-21 against Russians Vladimir Ivanov and Ivan Sozonov. But Satwiksairaj Rankireddy and Chirag Shetty managed to enter the second round. The Indian pair defeated Frenchmen Bastian Kersaudy and Julien Maio 21-12, 21-14 in 30 minutes.